Teeth are very important. It’s very important to take care of them. The cost of dentures is very high. Finding a replacement of dentures might also be a knotty task for your client. For cleaning and caring dentures, patients may require your assistance. If attention is not paid to dentures, it can result in mouth infections that may be difficult to cure. This article describes the appropriate way of how to clean upper and lower dentures. Wash your hands thoroughly. Obtain all required supplies. Wear the gloves. Greet your client. Explain that you are going to help out them in cleaning their dentures. Let the patient to remove the dentures himself and handle then to you, if he is able. Otherwise, you should be very careful while removing them. First, take out the upper denture. Gently move it up and down so as to rupture the seal. Now, gently slide it out of the mouth. Then, remove the lower denture in the similar way as you removed the upper one. Carry the dentures near the sink. Use a washcloth to line the sink. Now, partially fill the basin with warm water, but don’t put dentures in it. Hold them over the basin. Apply a little quantity of denture cleaner or toothpaste on the outside portion of the dentures. Clean them with a toothbrush in the similar manner as you clean your own teeth. Clean one denture at a time. Wash the dentures one by one, thoroughly. In order to prevent contamination, put them into a clean denture cup filled with cold water. Before re-inserting the dentures, use mouthwash and sponge swabs for providing oral care to the patient. If you find any infection (like lesions) in patient’s mouth, instantly report the same to the nurse. While re-inserting the dentures, apply required dental adhesive. Be sure that the client is in a comfy position. Finally, dispose the sink liner. Take out your gloves and dispose them. Wash hands again. Don’t forget to line the sink with a washcloth. 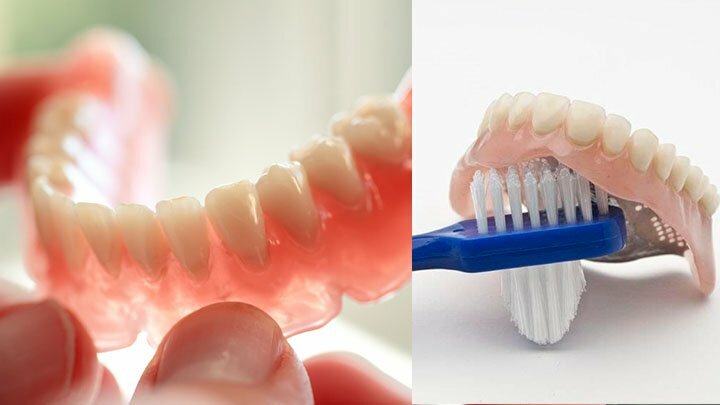 Instead of cleaning both dentures simultaneously, clean one at a time. While cleaning the dentures, thoroughly clean those areas that get in touch with the roof of the mouth or gums. Don’t re-insert the dentures, if the patient is suffering from any sort of mouth infection. To prevent complications, check the oral health of the client from time to time. What Does an Examiner Observe Assist a Dependant Patient In Dressing? Whether you have performed the basic tasks before initiating the skill demonstration? Tip- Before starting the skill demonstration, rinse hands properly and put on gloves. Obtain the required supplies. Have you positioned the patient correctly or not? Tip- Ensure the comfort of the patient at the time of positioning the patient. Whether you rinsed the oral cavity? Tip- Rinse the oral cavity before re-inserting the dentures. If you used right oral hygiene products for cleaning the oral cavity? Tip- Clean the oral cavity using good quality mouthwash and sponge swabs. Rinsed and cleaned teeth and dentures (if applicable)? Tip- If applicable, remember to clean and rinse teeth and dentures. Helped the client in cleaning and drying mouth area? Tip- Assist the patient in cleaning and drying mouth area. How you ended the task? Tip- Complete the procedure by disposing sink liners and gloves and washing your hands. Clean dentures of the patient on the regular basis, even if you don’t have enough time to do this. If you skip this task, the patient can get prone to oral yeast infections (candidiasis), bad breath, gum irritation, plaque and tartar. Never let the patient to sleep when the denture is inserted. During the rest period, massage their gums. It will maintain the blood flow and keep their mouth comfortable and healthy. Brush dentures, once the patient finish eating. You can clean them without removing. It will help in keeping the patient’s mouth healthy. Place a towel at the base of the sink, while cleaning dentures. Wet dentures are slippery. They can get cracked, if fall and hit the sink’s porcelain. In this circumstance, you will be accountable to replace them. Do not place client’s dentures on their bedside table or in a tissue. It can be disposed by the housekeeping staff, assuming it as a used Kleenex. In this case, you will be held responsible. This video will clarify you the correct process of cleaning upper and lower dentures.